If they [artists] do see fields blue they are deranged, and should go to an asylum. If they only pretend to see them blue, they are criminals and should go to prison. I never thought I’d be quoting this particular German art critic here but I have to admit that this quote makes me feel better about my work. Although the asylum or the prison have sometimes fell into my realm of possibility, it has been those blue fields (and Red Trees) that have kept me from either. Now do I see fields as blue in the real world? No. Do I pretend to see them as such? No. Maybe I’m not a lunatic or a criminal after all. But I do see the blue fields in this painting as real. Is that so crazy? I don’t think so and besides, seeing them as such makes me feel less criminally inclined. Above is a good example, a new painting that is a16″ by 20″ canvas titled Just This Side of Blue. This translates so easily in my mind, having a reality that I don’t question at all. For me, it as real as anything I see in the outer world. And the colors and the harmony they create resonate with me and pacify my tensions and angers. Perhaps Hitler should have kept a more open mind on the place of expression in art. In denying self-expression to others, he only demonstrated his own lunacy and criminality. The lesson: Be wary of those who try to control how you see things in your own mind. That is our greatest and last freedom– the right to our opinion and reaction. 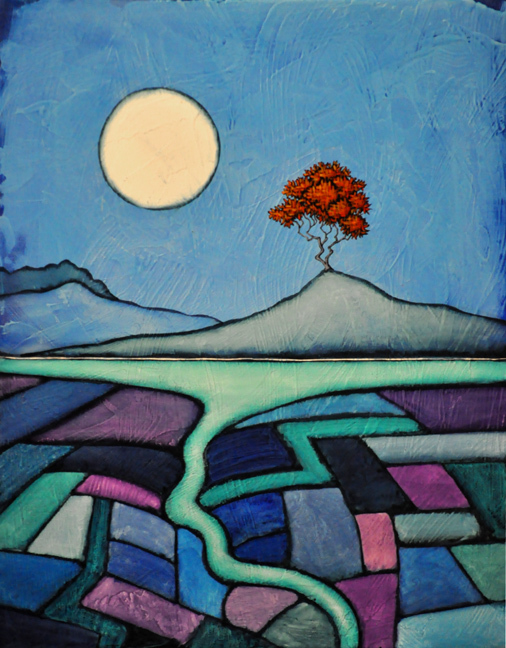 The painting shown here, Just This Side of Blue, is part of my solo show, In Rhythm, which opens at the West End Gallery on July 20, 2012. Last night on The Colbert Report, Paul Simon appeared and played a new Christmas song called Getting Ready For Christmas. Before singing he explained that it was based on a sermon from December of 1941, in the weeks after Pearl Harbor. The preacher was the Reverend J.M. 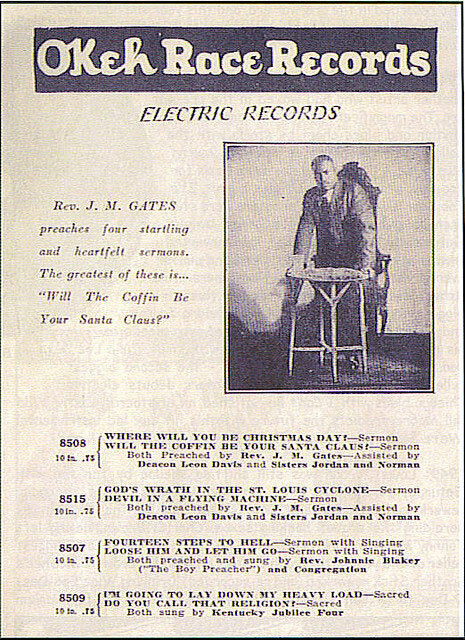 Gates, a fire-and-brimstone Baptist from Atlanta who was famous for recordings of his sermons in the years before his death in 1945. I don’t know much about him. Actually, I had never heard the name before last night. But the song Simon played was pretty good and there were samples of Gates’ recordings in the background at certain points in the performance that intrigued me. I don’t know exactly which sermon Simon sampled but there are several examples of Gates’ work online. One, Death’s Black Train Is Coming, was his bestseller and is a great example. My favorite however is Hitler and Hell which plays very well in the video off the sound of the footsteps of the jackbooted figure that goes through the darkness in it. I’m thinking that one of the recordings in the advertisement shown here might be the one used in Simon’s song. Will Your Coffin Be Your Santa Claus! sounds like it might be the one. Funny, that with such a catchy title it never caught on like Jingle Bell Rock or Grandma Got Ran Over By a Reindeer. Anyway, gives a listen to the Rev. Gates, if you are so inclined and here’s Paul Simon’s new song, Getting Ready For Christmas. It’s a very watchable video. I am always intrigued by symbolism and this date, August 1, marks a day and the start of an event in history that was filled with symbolism, It was on this day, seventy four years ago, that the 1936 Olympics held their opening ceremonies in Berlin in the Nazi Germany of Adolph Hitler. Hitler used the event as a world showcase for his vision of Aryan dominance and coordinated a spectacular ceremony that brought the Berliners to a feverish pitch as theyconstantly thrust their arms forward in the Nazi salute as their yells of “Heil” reverberated throughout the immense stadium. The Nazis knew how to use symbolism and spectacle, that’s for sure. Leni Riefenstahl’s Olympia, was a spectacular documentary of the games put together by the same woman who brought the world perhaps the greatest piece of propaganda ever produced, The Triumph of the Will. Both films used stark, powerful imagery and pageantry to convey a sense of power that overwhelms the screen. One can’t watch them withour feeling a bit of awe, mixed with an uneasiness akin to fear. Now on that day, as the teams of each nation made their way into the stadium they would pass the dais where Hitler and the Olympic officials sat. Each team would dip their flag in deference to their host and the assembled team members would collectively turn their faces to the right, in the direction of the dais. 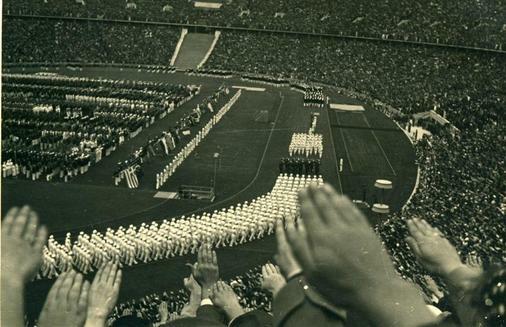 Many of the countries saluted in the Olympic manner which is very much like the Nazi salute except that instead of extending the arm forward, one extended their arm to the right. Of course, the partisan Germans that made up the majority of the 100,000 or so of the crowd that day took this salute to be the Nazi gesture and voiced their pleasure at seeing it. And to be sure, there were many who chose to honor the Fuhrer with the Nazi salute. The Bulgarians even goose-stepped their way past the dais. Symbolic of their opposition to the fascist regime and of what would take place in the next few years, the British assembly did not salute at all, simply turning their heads to the right as they passed. To the credit of the United States our athletes did not salute as well , instead taking off their straw hats and placing them over their hearts. And as we passed, our flag was held high, the only flag to do so that day. It dipped for no one, which brought on a thunderous chorus of derisive whistles. Of course, this is the Olympics of Jesse Owens, the black American whose achievements on the track rattled the foundations of Hitler’s idea of Aryan supremacy. Ironic, that he should strike such a symbolic blow against ridiculous ideas of racial supremacy even as he was being denied many basic rights in his own homeland. I can’t believe I failed to mention the birthday of Elvis Presley, who would have turned 75 a few days back. It’s not that I was the hugest of Elvis fans although I was an admirer of many of his songs and performances and recognized the attraction his talent had for many. It’s just that in death he has become this cultural phenomenon, an icon that has taken on almost mythic and mystical qualities for his ardent fans. That’s kind of what I saw when I painted this small piece a few years back. 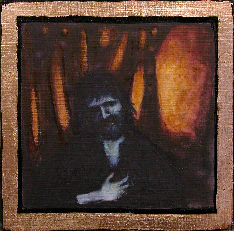 It’s called Elvis in the Wilderness which recalls Moses‘ exile to the wilderness. I may do a follow-up where Elvis leads the exodus from Eygpt. Or maybe Elvis healing lepers. Or perhaps traveling through time, battling various injustices throughout history. Elvis in hand to hand combat with the tag team of Hitler and Mussolini. Elvis at Valley Forge. TCB, baby. Just like the 3 letters on his huge belt buckle indicate. Taking care of business. It could be anything, anywhere. That’s the beauty of Elvis as a mythic character, a superhero. He fits easily into any time and setting with the powers imbued on him by his fans and as a result, never really dies. Here’s a performance that I really love if only for the iconic stance in his white suit before the huge ELVIS sign. Great visual. Ah, it’s good to be back in my studio after spending three days racing through seven states to deliver new work to galleries in Virginia and North Carolina. While it was good to spend a bit of time at the galleries, discussing the state of the art business at the moment, it’s always better to be here, focusing more on creation than on promotion and sales. I was able to listen to a lot of music while driving as well as catch some interesting stories on public radio that gave me something to think about. Yesterday, as I drove in the early morning rain of Virginia, I heard a story on NPR concerning the way Joseph Stalin is being viewed in present day Russia. In a poll last year, Stalin was chosen by Russians, in a sort of American Idol style vote, as the third greatest Russian of all time. 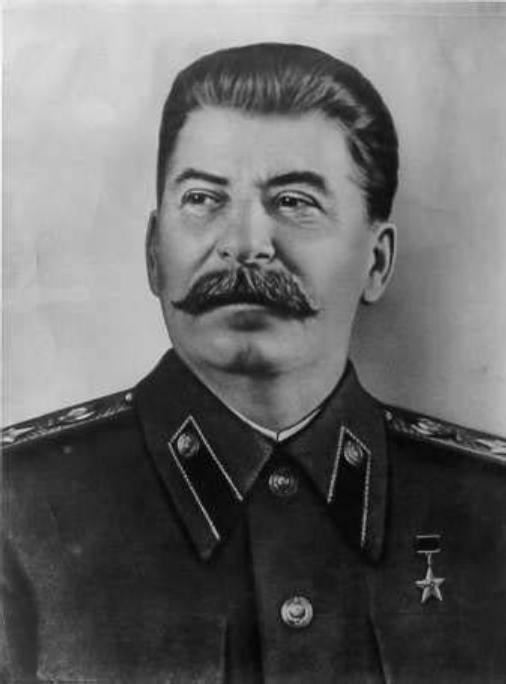 Despite the many millions, yes, millions of Russian citizens who were put to death by Stalin, despite the political purges and gulags and Soviet policies that caused a type of artificial famine that killed far more citizens than any natural famine more than once, the current populace said that this Man of Steel was their guy. In the story, a present day student compared Stalin favorably to the Adolph Hitler of the early 1930’s, in that both restored pride and self-confidence to their citizens in trying times. He also cited Stalin’s part in defeating Hiltler’s Germany in WW II as another reason for his positive view of Stalin. Other present day Russians have said that what Russia needs now is another Stalin. Rootin’ Tootin’ Vlad Putin has started reintroducing Stalin to the Russian public, reinserting verses praising Stalin to the national anthem that were long ago taken out. It gave me a bit of a chill. This revisionist history takes place everywhere when the times become a bit more difficult. The older population who lived through the Stalin era see the chaos of the current Russia and begin to romanticize for what they now remember as the stability of Stalin’s time. I have to admit, there is a certain level of stability in under a Stalin-like dictatorship. One doesn’t have a lot of choices or freedoms to clutter the mind. Most decisions are out of your hands. For many, this freedom from choice, when viewed through the distance of time, seems almost nostalgic. Ah, the way we were. The real question is, when there is this nostalgia for someone like Stalin, when the mindset of a large swath of the population begins to overlook the atrocities of a man like Stalin and the horror of those times, where is that country headed?